When you mention the name "Madame Tussaud" most people think of the wax replicas of celebrities and politicians housed in the infamous tourist trap, Madame Tussauds Wax Museum. Each sculpture’s eerie realism holds the key to their allure. Not only can you get two inches from a live model of Brad Pitt or Angelina Jolie, but you can also stare rudely at their wax twin without censure. It’s this last aspect that has fascinated visitors of Madame Tussauds for over 200 years. We all have the urge to look. Yet behind the glossy complexions of wax starlets, lies a story of a woman who survived the French Revolution to become one of the most famous makers of the dead. Marie’s story is so shocking that I have to put a parental advisory before continuing. Some of this content is of a violent nature. Marie Tussaud was born Marie Grosholtz in 1761 in Strasbourg, France. Her mother, Anne Made, took her to work as a housekeeper in the Berne home of Dr. Philippe Curtis who was highly skilled at wax modeling. Marie called Curtis her “uncle”, but rumors of the time implied that he may have actually been her father. Whether niece or daughter, Marie certainly inherited a talent for sculpting wax and Curtis nurtured this talent. Curtis and Marie re-located to Paris in 1765 and Marie’s skill secured her a position teaching art to Louis XVI’s sister, Madame Elizabeth. It didn't take long for Marie to get an invitation to live in the splendid court of Versailles. From daughter of a humble housekeeper to instructor to the king’s sister, Marie’s star was rising. In an age without photography, wax artists were the Papa Razzi of their day and Curtis’s Wax Salon was the leader in this new form of entertainment. Located at the heart of the burgeoning Paris entertainment district –20 Boulevard du Temple, Curtis had two sections to his exhibition. The first section contained wax models of the most glamorous Parisians. His most popular tableau by far was “Marie Antoinette and her family eating dinner”. Of course, spectators properly attired could already watch the real Marie Antoinette eat her dinner at Versailles for free, but society ladies and commoners alike chose to see Curtis’s show instead. Why? Probably because watching the real queen nervously put tiny morsels of food into her mouth was not as titillating as it seemed. Curtis’s show offered visitors something the real queen could not – a chance to stare. Just as the barker outside the exhibition promised ‘Come and see the royal family at dinner! Exactly as at Versailles,’ 1 visitors could get all the details of a Versailles dinner without the uncomfortable feeling of invading the queen’s privacy. Visitors could even see the far more salacious display of the queen in a low cut nightgown preparing for bed. Sadly, Marie Antoinette was far more enticing as a carnival peep show than a real person and Curtis was savvy enough to realize the public’s voyeuristic desires. Most of the details of Curtis’s exhibition survive through catalogs and guide books published annually. The wax faces certainly shared the same goal of hyper realism as they do today, but the bodies were usually rougher interpretations made from wood or leather and clothed in the latest fashion. The subjects were made from both life and death. Curtis and Marie would rub oil on the face and pomade on the hair so that the plaster would not stick. Then they would stick straws in the person’s nostrils so that they could breath. (This step was skipped if they were dead). Next, they would pour the plaster of Paris over the face that would later be used as a mold for the wax. Finishing touches were added with glass for eyes, real hair and yes….even real human teeth. This process is very similar to the death masks made in the 16th century discussed in a previous post. By far the most important detail of Curtis’s wax models was what they were wearing. 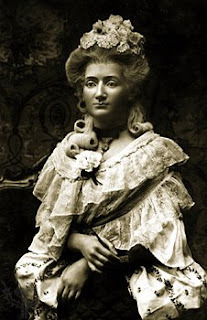 Women all over France, England and neighboring countries would visit Curtis’s Salon to see Marie Antoinette’s favorite dress made by her personal stylist, Rose Bertin or the King's mistress, Madame du Barry lounging in all her finery. Just as we look at mannequins in store windows or read fashion magazines today, Parisians stopped by Curtis’s Salon to see what the fashion cognoscenti were wearing. If it had not been for the Revolution, Marie might have lived a charmed life circulating amongst the French court and be forgotten today. Instead, her life was to take a drastic turn. On July 14, 1789, not far from the Boulevard du temple, the Bastille prison was attacked by a group of disaffected soldiers and seriously angry citizens. The initial goal was to get the Bastille’s ammunition, but like all good historical events, meaning was attached in the aftermath. The Bastille became the towering symbol of injustice that swallowed the rights of man within its gothic walls. (insert creepy organ music here). Yet to government officials, it was just an eye soar. 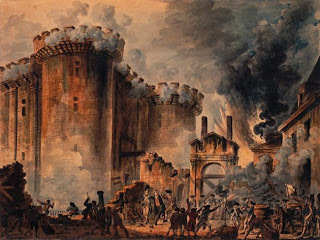 In fact, the Bastille was scheduled for demolition before the Revolution had begun and only housed 7 confused prisoners. Citizens got a jump-start on the demolition (and a chance to vent their anger) by tearing the Bastille Fortress down brick by brick. The governor, De Launay, surrendered and was taken to Hotel de Ville where he was beaten to an unrecognizable pulp. His head was hoisted upon a pike and displayed to the mob. The gory details are captured in the above print. Soon the crowd tired of the real head and decided that a wax head was needed to continue the revelries. De Launay’s head was brought to a shocked Marie and while she sat on the steps of her exhibition, the mob forced her to make an impression of the face. 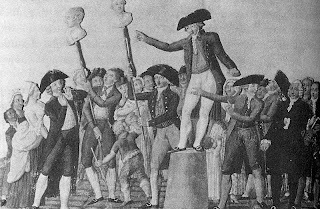 3 Nine days after the fall of the Bastille, Curtis got two more assignments – the severed heads of Foulon and his son-in-law. Foulon had been named to replace the much loved finance minister Necker, but had the misfortune of making a badly timed comment suggesting the starving peasants, "eat hay". For this remark, the mob lopped off his head, put it on a pike and added in the extra embellishment of hay in his mouth. Things were getting ugly. The violence continued for years while Marie and Curtis recorded details of the dead in wax effigy. One of the most grotesque blood baths occurred on September 2nd, 1792 when Marie-Louise, Princess de Lamballe was attacked by an angry mob. 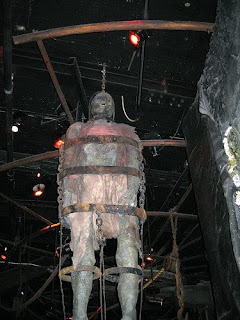 After her death, her head was decapitated and...you guessed it.... put on a pike. The manic crowd then took her pubic hair and used it to make a mustache. Amongst the carnage the bloody head was carried to Madame Tussaud and she was forced to apply makeup to the face. The mob then took their trophy art and paraded it outside Marie Antoinette’s window. The queen fainted when she saw her friend’s mutilated face. Curtis now had the opportunity to reinvent his business. Gone were the days of wax figures as fashion plates. Now, Curtis’s wax figures became the Revolution’s news snapshots. Wondering who was sent to the guillotine? Just stop by Curtis wax works for the latest news. And unlike print, the medium of wax was much harder to censor. Marie Tussaud would go on to make death masks of Marie Antoinette, Louis XVI, Charlotte Corday, scary Robespierre (shown here), Marat and sadly her former employer – the selfless Madame Elizabeth. After an execution took place, Marie crept into Madeline Cemetery with her carpet bag of tools and set to work making her effigy of the famously dead. Whenever you think your job is tough, think what it would have been like to pick through decapitated heads in a graveyard and make molds from their faces. Then think what it would have been like to pick through decapitated heads of people that you once knew. Worst of all, Marie had no choice. It was a life full of danger because she never knew when the mob would turn on her. Marie’s life after the Revolution is less dramatic. She married a deadbeat speculator named Francois Tussaud in 1795. 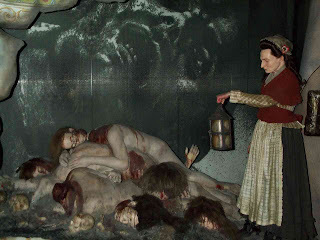 In 1802, she left the horrors of the Revolution behind her (and also her husband and youngest child), and spent the rest of her life traveling throughout England displaying her wax models. Marie Tussaud never returned to France. She died in 1850, at the age of 88. Her sons carried on her legacy by displaying her wax models and growing the enterprise that has become Madame Tussauds Wax Museum today. 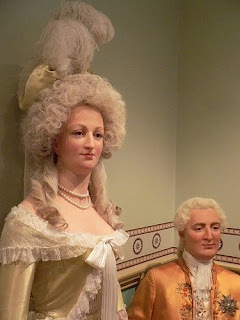 Many of Marie’s models can still be seen today in Madame Tussauds, London including the deaths’ heads of Robespierre, Louis XIV, Marie Antoinette, Marat in his bath and even the guillotine that killed Marie Antoinette. Wow. What a life right? It’s a pretty unbelievable tale. Hollywood could make a movie out of it. And it must be true because you read it on the internet. It’s even written by a fairly sane person. Or wait….I think she is sane? No, she has to be sane. She writes children’s books. They don’t let insane people write children’s book. 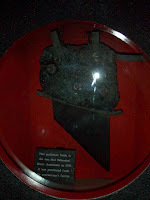 (2) Or at least that is what the museum claims. Stay tuned for next post to find out if it that is complete rubbish. (3)Pilbeam claims that this account comes from Madame Tussaud and Circus owner Philip Astley but no footnote is provided. Marie Tussaud makes no mention of De Launey’s murder in her memoirs. (4) At least that is what Marie Tussaud claims. Tussaud, Marie. The Memoirs of Madame Tussaud, Saunders and Otley, 1838. Bertridge, Kate. Marie Tussaud: A Life in Wax, New York, NY: Harper Perennial, 2007. Pilbeam, Pamela. Madame Tussaud and the History of Waxworkds, London and New York: Hambledon & London, 2003. WOW! What a post! What a life! I can't imagine her going on to live 'somewhat normally' after seeing and being hands on (sorry)to all of it. Incredible, but has to be true. Can't wait until the next part. Thanks. Sad life =/ I know I wouldn't handle decapited heads. Awesome post!!!! I love this stuff! This is truly an amazing story! And a brilliant post, such enormous fun to read. No offense,but I noticed a few spelling errors, chiefly that you misspelled "Beauharnais." However,I think that this was a very informative post. Congratulations! The head you say is Robespierre's is not of him. Scary it may be but it is of someone else. Check the images of his actual death mask.